Daily Sun photos/Michael Kormos The 100 Club of Navarro County presented the Corsicana Police Officer Michael Worthy, Telecommunicator Emily Owens, Officer Heath Hayes and Cpl. Kenneth Dunnagan with its highest honor Thursday. Daily Sun photo/Michael Kormos The 100 Club of Navarro County presented two local students, Hannah Bland and Baileigh Johnson, with $1,500 David Coley College Scholarships. Everyday Navarro County law enforcement officers kiss their loved ones goodbye and head into uncertainty. What could be a day of traffic stops and barking dog calls sometimes turns into a life-altering situation. It's during these life or death moments that seconds count and this year's Brent Thompson Officers of the Year exhibited bravery during one of those times. The award, named for Corsicana's Brent Thompson, who was killed in the line of duty during the July 2016 ambush on police in Dallas, was presented for the first time to multiple officers. The 100 Club of Navarro County presented the Corsicana Police Department's Telecommunicator Emily Owens, Cpl. 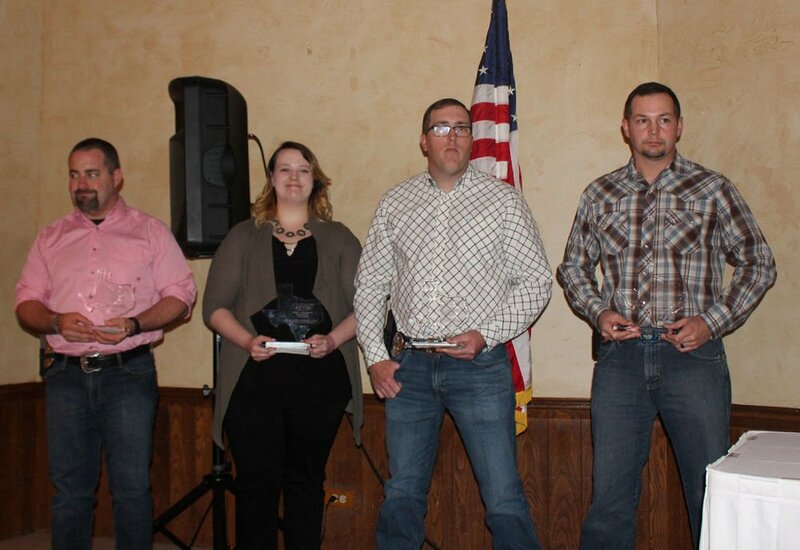 Kenneth Dunnagan, and officers Michael Worthy and Heath Hayes, with its highest honor Thursday night at its annual banquet at the Corsicana Country Club. Corsicana Chief of Police Robert Johnson described the officers' actions during the night of a double murder-suicide, only days before Christmas, for which they were honored. Johnson said the gunman killed both women before turning the gun on himself, which police did not know, as they arrived on the scene only about 20 seconds after the last shot was fired. Johnson estimated the whole incident lasted less than three minutes. 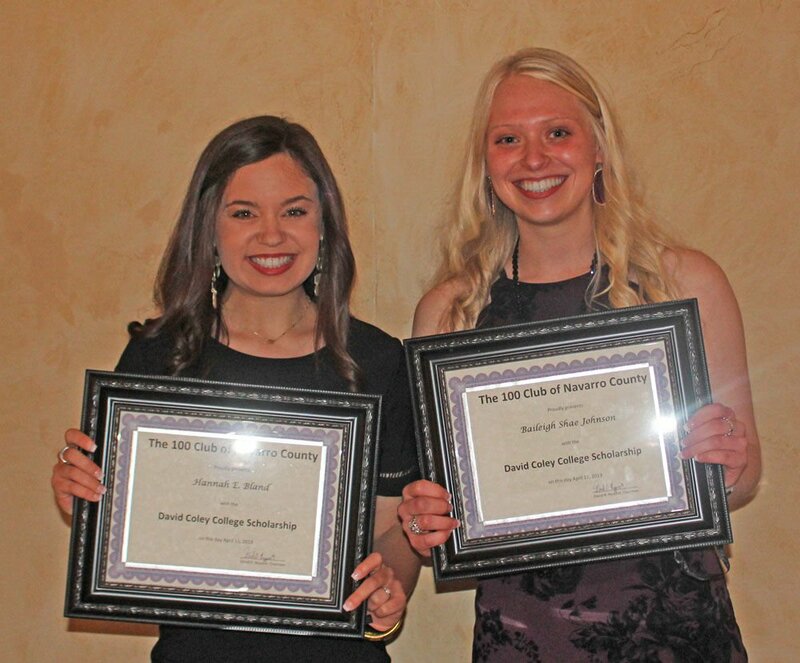 The 100 Club of Navarro County also presented two local students, Hannah Bland and Baileigh Johnson, with $1,500 David Coley College Scholarship, given annually to well-rounded students who are family of law enforcement. Club Chairman David Nyquist Jr. also recognized special new member, Orion Gaston, 12. Gaston is the daughter of a Navarro County Sheriff's Deputy and estimates her lemonade stand has raised around $3,000 to support law enforcement officers. Local department heads talked about how they spent funds raised during this year's “We've Got Your Back Fundraiser.” Kerens Police Chief Brian Miers said his department bought seven laptop packages for its patrol vehicle. Dawson Police Chief Michael Carter said his department bought iPads to update its citation writing system. Corsicana Police Chief Johnson said his department purchased a FLIR system which detects heat signatures which allows them to identify a suspect in total darkness or even after fleeing a scene. Corsicana ISD officer Jeff Swanson said his department purchased body cameras for all officers. Navarro County Sheriff Elmer Tanner said his department purchased suppressors for weapons and a camera system. Nyquist said the Club's mission is to support the families of fallen officers, purchase life-saving equipment and provide training to local departments. Nyquist said the 100 Club now has over 300 active members, up from only about 50 when he took over. Nyquist said his goal is to sign up 1,000 members. If you are interested in becoming a member of the 100 Club of Navarro County you can contact them via the Facebook page or contact David Nyquist at 903-874-8228.